The Cayman Series Sidepost Umbrellas, also known as Offset Pole Umbrellas, rotate a full 360 degrees and tilt from side to side making them some of the most versatile sidepost patio umbrellas on the market. Sturdy, yet beautifully designed, the C-Series sidepost umbrellas are available with a hexagon, square, or oval canopy. In addition, the rugged aluminum frame comes in several different colors: White, Taupe, or Graphite; the frame is also available in a unique Teak wood. The Cayman Series Sidepost Patio Umbrellas have a crank lift, and the canopy is available in 16 choices of stunning and weather resistant Sunbrella fabrics. 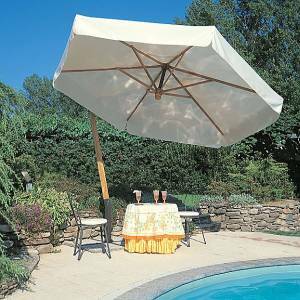 Many traditional patio umbrellas must be placed in the center hole of a patio table to keep the umbrella from tipping over. 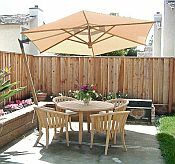 Unfortunately, the table itself benefits the most from the umbrella�s shade, leaving at least one person under the umbrella partially or fully exposed to the sun�s heat and harmful rays. Making sure everyone stays shaded and comfortable on the patio, deck, or at pool side from sun up to sunset is the job of a Sidepost or Offset Pole Patio Umbrella. What makes a Sidepost Patio Umbrella so special? 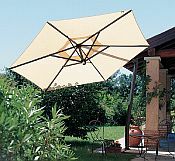 There is no pole in the umbrella�s center to take up precious space in the shade. 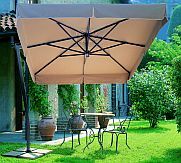 Every person in your party can enjoy the comforts of shade under a Sidepost Umbrella, and when the sun changes position in the sky, you can easily and quickly change the tilt or rotation of your Patio Umbrella to prevent anyone from experiencing unnecessary exposure to the sun. Please click on the umbrella you are interested in below for additional information.